Today we spent an hour or so emptying the glen of poetry, prayer flags, multi coloured ribbons and water wheels. I like this way of doing church! A few bits and pieces had been taken by the wind- so if you are up there and see the odd plastic packing box or garden cane with poetry attached, I am afraid we lost one of each. The water wheel was torn loose at some point over the last couple of days, but managed to twirl away through the worst storms in memory – not bad for something made of scraps and bits of skateboard. 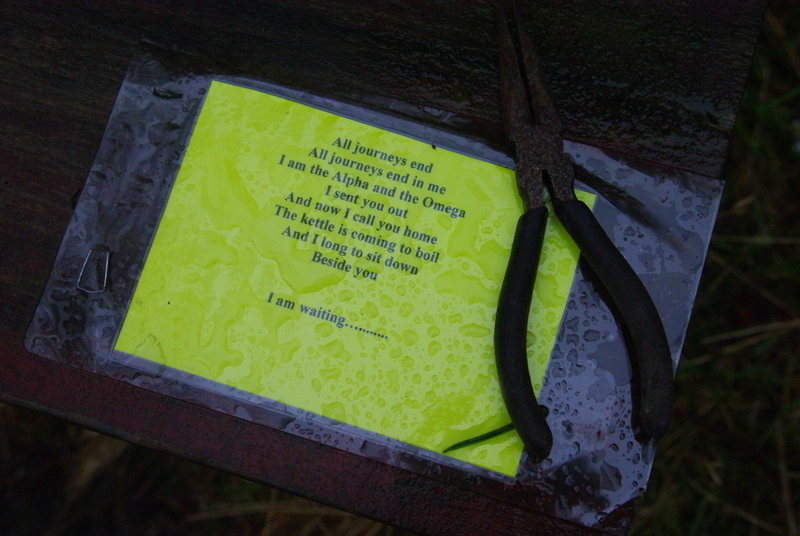 We placed a letter box at the end of the walk for prayers/comments, and it was full of lovely things- people who were clearly moved by the experience – some who had lost loved ones recently, others who were just here on holiday and stumbled across it whilst out for a walk. People had obviously used the different interactive bits, despite the extreme weather- the leaves to write on and throw in the stream, the prayer flags, the weaving. May you all carry some blessings into this coming year. This entry was posted in meditation, photography, Spirituality by Chris Goan. Bookmark the permalink.